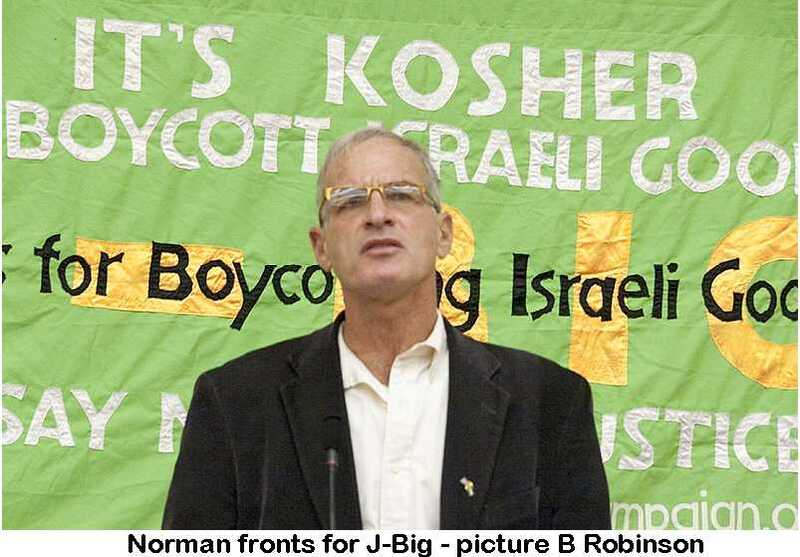 Norman Finkelstein [NF] is an enigma. On the one hand he is a brilliant analyst of Zionist attempts to rewrite history. He has no difficulty deconstructing Zionist attempts to paint themselves as the victims but on the other hand he has a blind spot when it comes to a solution to the crisis. For years he has been pleading the case of the 2 State Solution (2SS) and, as my quote below demonstrates, he sincerely believed that the 2SS was about to be realised during the Obama reign. It is always a haphazard and dangerous process to draw conclusions from an individual but it would appear that the reason for the schizophrenic divide between NF’s analysis of Zionism and his solutions are based on his Maoist background and in particular his lack of any class analysis. It is the lack of a class analysis internationally which results in NF seeing the world as one big ‘international community’ rather than a set of imperialist states, led by the United States and the rest of the world which is subject to the manipulation and at times violent interference by those same Western states. NF doesn’t see that when the West is unable to impose its rule via client rulers and puppets and when, on occasion, radical leaders like Hugo Chavez come to the fore, then the United States and its European lackeys have no hesitation in destabilising and if necessary invading that state. It is the lack of any class analysis which results in NF believing that ‘international law’ and its agencies will somehow impose their will on a recalcitrant Israel rather than that international law itself is a consequence of the imperialist order, which is only enforced when the powerful want it to be enforced. I reprinted the The End of Palestine? in order to show that if anyone doubts what I am saying then they should revisit NF’s interview with the Left Project to see how he got it so disastrously wrong in believing that Zionism could ever concede a Palestinian state. I also published Norman Finkelstein –A Wasted Opportunity & Self-Indulgence after his 2011 lecture. A subsidiary problem with the 2SS that NF endorses is that it leaves in place a Zionist Israel. To NF this seems to be no problem and at his 2011 talk at the Institute of Education he dismissed Israel’s racism against its own Palestinian citizens as no worse than that in Europe or America. I have written a number of polemics against NF not least when he attacked BDS as a ‘cult’. They include The End of Palestine or the End of Norman Finkelstein? and my The Tragedy of Norman Finkelstein – Time to Say Goodbye which Ilan Pappe described as 'a brilliant refutation of Norman's position', e- mail 18.2.12. 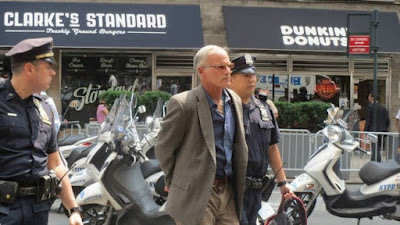 In an article last month, ‘Lessons from Finkelstein: International Law and equal rights should be the focus for Palestine solidarity,’ Seth Anderson maps out a strategy for the Palestine solidarity movement by drawing on the analysis and prescriptions of Norman Finkelstein. 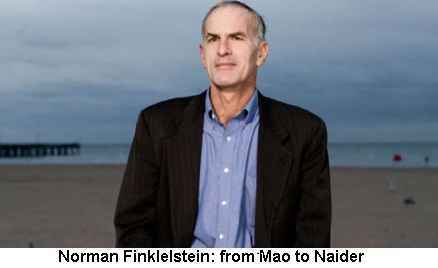 There is no doubt that the movement owes Finkelstein an enormous debt of gratitude for his incisive polemics and analysis. There is no one who did a better job in deconstructing and destroying Joan Peter’s fraudulent From Time Immemorial, which claimed that the Zionists colonised an empty Palestine. When Daniel Goldhagen wrote his execrable book Hitler’s Willing Executioners: Ordinary Germans and the Holocaust, which argued that the Germans, not Nazis, killed Jews because they were a sadistic and cruel nation that had imbibed eliminationist anti-Semitism with its mother’s milk, Finkelstein took him apart. So devastating was Finkelstein’s criticism, that Goldhagen threatened to sue him for libel initially rather than reply to the substance of the criticism. 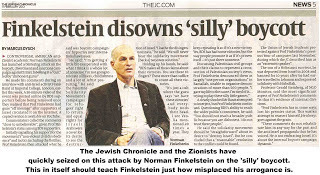 The problem with Finkelstein’s analysis of Zionism and his proffered solutions is that they exist in intellectually watertight compartments, ne’er the twain shall meet. Finkelstein’s devotion to the Two State Solution, or 2SS, has entirely distorted his understanding of the relationship of power both inside Palestine/Israel and internationally. this agreement will lead not to an independent state but to further misery and defeat. The one concession, recognition of the PLO by Israel, means little when all that the PLO symbolised is now forsaken. Maybe a biblical analogy is most appropriate: Esau selling his birthright to Jacob for a mess of pottage. Finkelstein’s repeated prediction of a settlement cannot be divorced from his basic premises. Finkelstein fails to understand not only the dynamics of Zionism but the world’s power relationships and the political order. Seth Anderson asks, “Who are we talking to?”. The answer to that is simple. We are talking to all those who can be won to support for the Palestinians and the struggle against Zionism. We are campaigning against Israeli Apartheid and its practical application. Zionism might be the name of a hairspray or cologne “for most people,” Finkelstein has said, but it isn’t for Palestinians or Israeli Jews. Zionism is a political movement and ideology, based on the doctrine of racial supremacy, that functions as the Israeli state’s principal guide. Zionism is the backdrop to the Israeli State’s day to day assumptions and practice. Zionism is not an ideological construct or a perfume. It is a lived reality for the Palestinians. Our task is to persuade people through our campaigns that Israel is not just another example of human rights abuses. It is because of Zionism that the Israeli state has developed a unique system of institutionalised discrimination found historically in such countries as apartheid-era South Africa and Nazi Germany. Seth argues that we should be ‘pragmatic’ in the way we go about creating a ‘broad public opinion in favour of the Palestinian cause’. I’m not opposed to pragmatism but I don’t believe you should subordinate your principles to it. We need to argue that Israel cannot be reformed precisely because it is a settler colonial state. Would our task have been easier if we had simply concentrated on South Africa’s human rights abuses and ignored the structural discrimination and racial segregation inherent in Apartheid? Far from making our job easier, Seth’s and Norman’s answer makes it more difficult. South Africa’s response to criticism was to say ‘what about the Black African states’. Israel’s response is not dissimilar – it points to the gross human rights violations in the surrounding countries. Of course our criticism of Israel must encompass its human rights violations but in arguing for equal rights we cannot avoid the question of Israel as a Jewish state. The Palestinian issue is not fundamentally a human rights one. It is a political question. Seth justifies Finkelstein’s reliance on ‘international law’ by asking us to engage in a false choice. He counterposes ‘feel(ing) good about myself’ to wanting Palestinian children to go to school unharmed. Of course presented like this, who would not choose the latter? Not content with this rhetorical device, Seth then offers us a non-sequitur. Choosing Palestinian children going to school also means him having to put aside his own moral standards. I’ll let Seth into a secret. I am not an anti-Zionist in order that I can assuage my conscience. If I thought that it was really possible to force Israel to comply with ‘international law’ and grant equality between Israeli Jewish children and Palestinian children, then I wouldn’t have a second thought. However my anti-Zionist politics tell me that Israel, because it is a Zionist state cannot grant equality to non-Jews. That is the whole point of a state which defines itself, not as a state of all its own citizens but as a Jewish state. According to Finkelstein, we have to work ‘within the existing framework’ and ‘the law is the framework’. But don’t despair, because, as Finkelstein points out, the law is completely on our side. Seth reels off a list of examples – the Occupation, the Siege of Gaza, the Annexation, the Wall. As regards the Right of Return, Seth disagrees with Norman. This too is guaranteed by UN resolution 194. What could be simpler? How could a Jewish Marxist dogmatist impose his beliefs on the Palestinians and thus delay their day of redemption? The key here is ‘within the existing framework’. Given the existing constellation of forces in the Middle East, with Israel as the United States strategic watch-dog and with its de-facto alliance with the most repressive regimes in the region, no solution to the Palestine crisis is possible. Without a thaw in the political permafrost no change is possible, either for the Arab masses or the Palestinians. When Netanyahu says that no settlements will be removed or Israel’s Deputy Foreign Minister Tzipi Hotovely states that ‘This land is ours. All of it is ours. We expect as a matter of principle of the international community to recognize Israel’s right to build homes for Jews in their homeland, everywhere.”  which part of these statements does Seth or Norman not understand? Of course if this was Britain or France or even Donald Trump’s United States, once the highest court in the land had thus ruled one would expect the Wall to crumble along with the settlements. But here is the rub. Although ‘international law’ is indeed on the Palestinians’ side, it makes not a blind bit of difference. True, the Palestinians have a President of the make-believe Palestinian state, but no one is deceived. International law is a strange beast. There is no one body of law which is accepted by all. It consists of a series of conventions, treaties and UN Security Council resolutions. There is the International Criminal Court and the International Court of Justice, but they apply primarily to states not individuals. There is no single Supreme Court and more importantly there is no enforcement mechanism. In other words International Law only works where the United States is in agreement. Most people would agree that the pre-emptive attack on Iraq in 2003 was a war crime according to the Nuremberg Trials in Germany. Yet neither George Bush nor Tony Blair were indicted at The Hague. Who was going to arrest them? Or prosecute them? I suspect Netanyahu and Defense Minister Avigdor Lieberman sleep fairly soundly knowing that they are unlikely to be arrested for defiance of international law. If within a state the application of the law reflects the class nature of that state, in that it falls most heavily on the poorest and weakest in society, it does at least formally apply to rich and poor alike. Both rich and poor alike are prosecuted should they steal food, but of course the rich have no need to steal! It is not surprising that the ICC has only prosecuted African or Serbian dictators. International law is only enforced against the weakest. If it is the case that we must work within the existing framework we can never win. There is an old Zionist saying. ‘The facts come first and the law comes after.’ Zionist strategy in Palestine operated on the basis of creating facts on the ground. First establish the settlements and the law will adjust accordingly. Of course most states, the USA excepted, adhere to the notion that the settlements are illegal. But the hypocrisy of these same states can be measured in the degree of their opposition to Boycott, Divestment and Sanctions (BDS). If the European states were at all serious about their opposition to the colonisation of the West Bank or the illegal blockade on Gaza then they would not be granting Israel most-favoured-nation trading status. 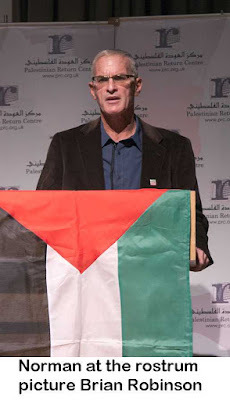 Finkelstein is correct that the return of the refugees would mean the end of the Israeli state as it currently exists. It is arguable whether the UN in 1947 intended for Israel to become an apartheid state via the expulsion of the majority of the Palestinians but that was the effect of the decision. Here however is the conundrum. As long as Israel remains an ethno-religious state then there will be no dismantling of the settlements, nor will there be any equality of rights. The Right of Return does indeed spell the end to Israel as we know it but that is an essential precondition to a Palestinian/Israeli state of all its citizens. I disagree with Seth that a 2SS represents the best or indeed any hope for the Palestinians. Given the disparity of power, a Palestinian state could only be a fiction, not even a Bantustan. But if Israel were forced to de-Zionise, why would one want to repartition the area? Seth says that decolonization has to come from within and the idea that it could come from the outside ‘is a colonial idea in itself’. So presumably when we supported decolonisation in South Africa we were being colonialists? Or those who supported Indian independence were also colonists in disguise? This is a mere playing with words. Finkelstein bases his schema on international world opinion as represented by the United Nations. He places his faith in the basket of the ‘international community’. It has as much relation to reality as Alice’s Wonderland. The UN is a body whose Human Rights Council was chaired by Saudi Arabia! It is a gang of thieves and imperialist cut throats. The Security Council represents the interests of the major powers, no less and no more. In practice the UN is under the thumb of the United States, as we saw when the UN Secretary General insisted that the Report of the Economic and Social Commission for Western Asia, which defined Israel as an Apartheid state, headed by Professors Virginia Tilley and Richard Falk had to be ditched. The intellectual edifice that Finkelstein has constructed in support of a 2SS is built on sand. It fails to comprehend the unique features of the Israeli state and why it is unique. The position of Israeli Palestinians, a population that is seen as a potential fifth column and temporary non-Jewish residents of a Jewish state, is also unique. Finkelstein sees a rational world order. I see one in which the United States maintains a world empire through deceit, corruption and military might. Only a mass movement from below will be able to change the political geography of Palestine and the Middle East. Norman Finkelstein on Joan Peters legacy (and Dershowitz’s legal troubles). Birthright sold for mess of pottage, Labour Left Briefing, November 1993.